At Lightning Training Solutions our fire safety courses are comprehensive and fully accredited, so whatever industry or organisation you work at, we can provide you with fire safety training across Somerset. Fire safety awareness training not only helps users to understand potential fire risks but also the appropriate way to react to them. The course has been specifically designed to reduce the risk of fire through the promotion of fire safety awareness and basic training for staff, groups or individuals. The Fire Safety Order requires that fire safety training is provided to staff when they commence employment and that refresher training is provided regularly. Whilst fire isn't always the biggest safety risk that any businesses ever have, without fire safety training your insurances may not be valid and your staff may be left vulnerable. Every year many people are killed and more are injured in fires at work, the financial consequences of fires can also be devastating, all employees should be made aware of what to do in the event of a fire and how they can be prevented in the workplace. Employees require a greater awareness of the threat posed by fre to people, property and business, at Lightning Training Solutions, our fire safety courses in Somerset will provide you with the necessary knowledge to ensure safety at all times. We can provide UK wide Fire Safety courses for your staff. The Regulatory Reform (Fire Safety) Order 2005 has made Fire Safety Training a legal requirement for staff members. The courses we provide are expertly delivered in-house, with programmes that will suit you, our customers. Many businesses will need fire marshals as part of their operations. Understandably these fire marshals will require additional training in order to perform their role effectively. We offer in depth courses that give people a full understanding of fire safety issues pertaining to effective evacuation procedures and methods of fire prevention. The objective of this course is to know how to reduce fire risks, deal with fires and if necessary, escape with safely in the event of a fire. 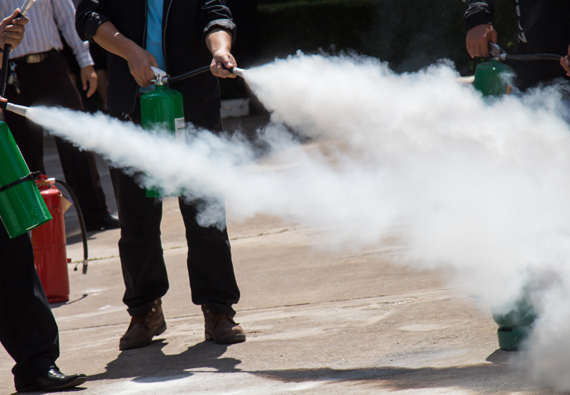 The course will present an understanding of fire regulations and general fire precautions, it aims to provide you with the knowledge to become a fire marshal. If you are based in Somerset and you are interested in an Fire Safety Awareness courses and training at Lightning Training Solutions our team can help. We aim to deliver successful, efficient and cost-effective training to customers and clients across the surrounding areas. We’re committed to ensuring that this investment is made of the most of, whether you’re an individual or a company. What’s more is we take pride in making sure that we only provide the highest standards in every aspect of the services we provide. Looking for a fire safety training course with a first aid qualification?